Mid and East Antrim is a haven for young children and it’s packed with safe, secure play areas for them to unleash their energy. Play is an essential part of every child's life and is vital for the enjoyment of childhood as well as social, emotional, intellectual and physical development. When children are asked about what they think is important in their lives, playing and friends is usually at the top of the list. We want to hear your thoughts on our Draft Play Strategy. Go to our Consulations section to complete the survey. We are in the process of developing a Borough wide Play Strategy entitled ‘Out to Play’. The initiative was officially launched on Wednesday 3 May in the beautiful setting of Dixon Park, Larne. Play is extremely important in keeping our children fit and healthy, physically and mentally. It has been proven to increase imagination, improve social skills, reduce stress and improve physical skills including strength, coordination and balance. Play also benefits the community by involving children in creative and positive activities, helping reduce anti-social behaviour and reducing the risk of crime. Facilities become a focal point for the community, families are better supported and young people are helped to prepare for adult life. The Play Strategy is being developed by talking to and working with children, parents, the local community and partner organisations and always checking back to ensure we are doing it right. At the beginning of the year, Council extended an invitation to all schools in the Borough to get involved in the consultation process and six schools were chosen - St Anthony’s Primary School, Gracehill Primary School, Glynn Primary School, Braidside Integrated Primary School, Carrickfergus Central Primary School and Millquarter Primary School. The pupils worked alongside facilitator Dawn Aston and enjoyed outdoor workshops and creative sessions to identify what they like about their area, what they think could be improved and how young people spend their free time. The pupils created a wonderful display to showcase their thoughts which was presented at the launch event. The pupil’s opinions are very important to us and will help shape the Play Strategy. 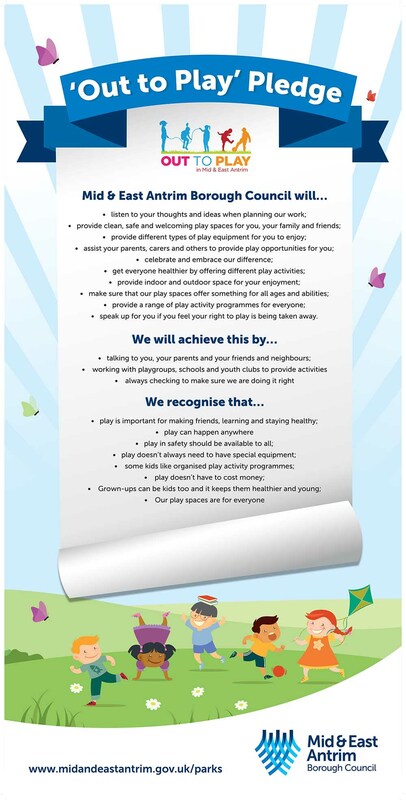 The ‘Out to Play Pledge’ sets out our commitment to the children and young people of Mid and East Antrim Borough. The Pledge was developed in recognition of UN Convention on the Rights of the Child (Article 31). Generally, it sets out what we will do for children and young people, how we intend to achieve this and it also recognises the importance of play internationally. In our words, Council will ensure that play spaces and activities here in Mid and East Antrim Borough are planned in a way that ensures all children and young people, of all ages, can take part, learn, find new friends and have fun. Click on the 'Out to Play' Pledge to view a larger version of the image. If you would like to have your say on play provision in the Borough please complete a short survey. We and are particularly keen to hear from our younger residents. The right to play and informal recreation, for all children and young people up to 18 years of age, is enshrined in Article 31 of the UN Convention on the Rights of the Child, ratified by the UK government in 1991. The government has a duty under this convention to protect and promote play opportunities for all children and young people. All Play Parks are open from Dawn to Dusk. The equipment in our Play Parks are suitable for children aged 3 to 12 years old only. All children should be closely supervised by an adult at all times. For further information on any Play Park or if you wish to report any damage, abuse or incidents, please contact the Parks & Open Spaces Service on T: 0300 124 5000. Dog faeces can pose a significant health risk to humans, particularly young children as their immune systems are not fully developed. Children are also more likely to come into contact with soil or sand that contains dog faeces whilst playing in parks, gardens and playgrounds. All faeces contain bacteria that can cause stomach upsets, but the greatest risk is from toxocariasis. Toxocariasis is particularly hazardous to small children as it can result in blindness. You might have heard of Toxocariasis, but do you know exactly what it is and how to prevent it? Even if you don't have a pet, make sure you're aware of the risks. For further information download our Toxocariasis Information Sheet.